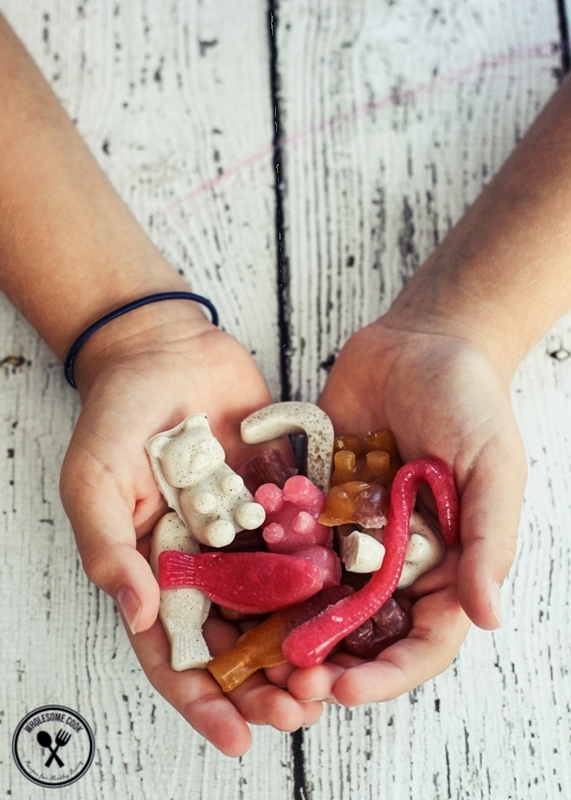 They are the kind of lollies you won’t mind your kids having. 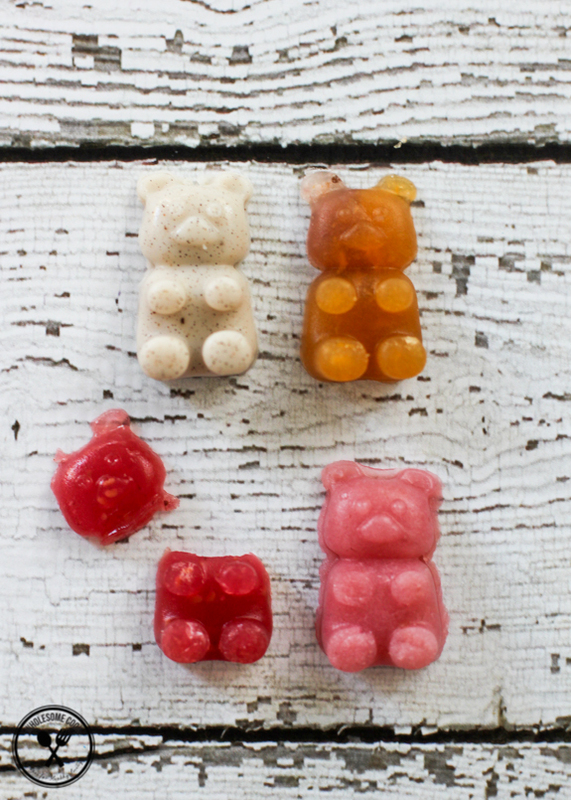 Homemade Gummy Bears in 4 whole food flavours: tasty, healthy and set in minutes! 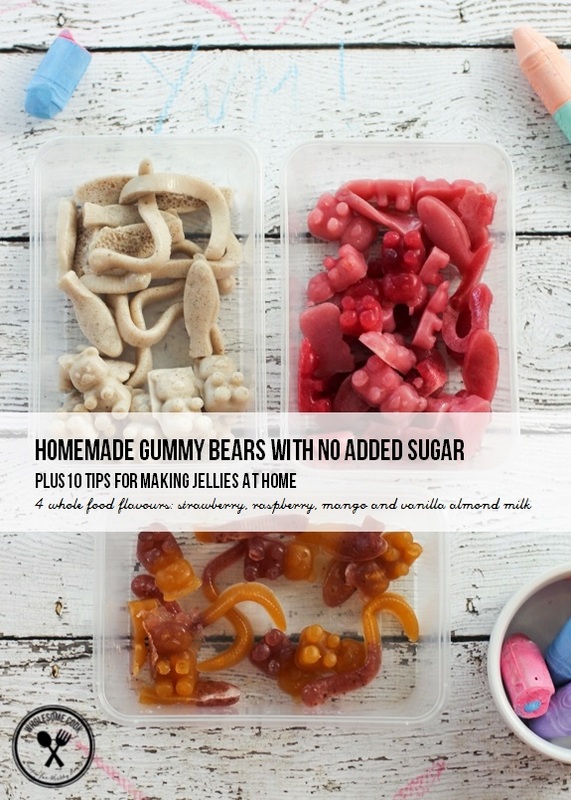 PLUS 10 tips for making jellies at home and a vegan version as well! If you walked into our kitchen the weekend before last, you might have found yourself in the middle of a lolly making frenzy. The countertops were covered in strawberry, mango and raspberry splotches – some set, some smudged and others just sitting pretty. Excitement was brewing as the mixtures of whole fruit and gelatin warmed on the stove – no sugar in sight! Spoons and whisks exchanged hands at the right moments, gummy shaped moulds were filled with flavourful mixtures and great precision. We had four carefully picked flavours on the go at any one time. 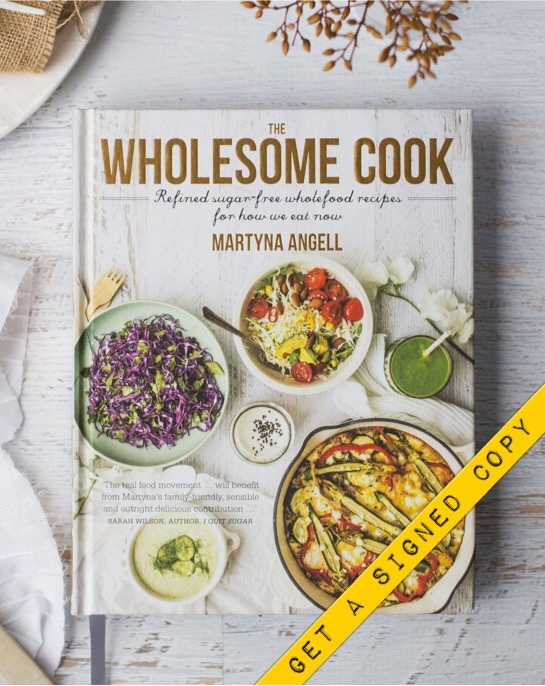 – my debut cookbook, The Wholesome Cook, featuring 180 refined sugar-free recipes all with gluten-free options. Plus detailed additive-free shopping guides, wholefood kitchen tips and my take on sugar, fat, gluten and legumes, soy and dairy. If you’re really serious about busting sugar for good, check out also Sarah Wilson’s cookbooks and 8-week program. Did you know that gelatin is a fantastic source of protein, promotes a healthy thyroid function, is great for joint-health, collagen production and gut healing? It is recommended for people nursing broken bones, wounds and sprains. It is also said to suppress tumor growth and liver health (source – and there’s more). I’m surprised it hasn’t re-earnt its stripes as a superfood yet. In testing the recipe, we use either the Great Lakes grass-fed gelatin powder or Vital Proteins grass-fed beef gelatin powder – more on that in the tips. For a vegan option see notes below. Sneaky me, to healthy things up a bit further, decided to get adventurous and make jellies using almond milk and vanilla powder mixed in with Inner Health Plus dairy-free probiotics for gut health. And, my oh my, were they something else! I give you some pointers in the tips below on how not to over-heat the probiotic powder jellies. We churned out about 6 cups of jellies that day. Mixed flavours and densities, because we wanted to be thorough so that you could be better informed when making your own. 1. We used both gelatin sheets and powder. The sheets were slightly easier to melt evenly, but they come in various sizes and even strengths so measuring them can get tricky. In the end we stuck with this grass-fed gelatin powder or this grass-fed gelatin powder, being the most natural gelatin source. 2. We also tried a few different ratios of gelatin to set them and found that 3 tablespoons of gelatin per cup renders the best result. Soft and chewy, but not as temperature sensitive as the 2 tablespoon mixture, nor was it as hard as the 4 tablespoon one. See notes below for a vegan version. 3. Non-acidic fruit is best for jelly making, otherwise jelly may not set (pineapple and kiwi fruit tend to be most problematic). 4. For best results puree room-temperature fruit using a stick blender. Allow frozen fruit puree to come to room temperature also. You can strain the seeds away (from berries) if you like, but we quite like the added texture. 5. Things you can add to the jellies are probiotic, protein or green powders, maca, cacao, mesquite, bee pollen, vitamins, fish oil. If adding probiotics, remember that they are heat-sensitive. Add these to slightly cooled liquid only or divide the liquid in half and heat only half of the content. This will also help preserve heat-sensitive vitamins into the gummy shapes. 6. Use a silicone mould. 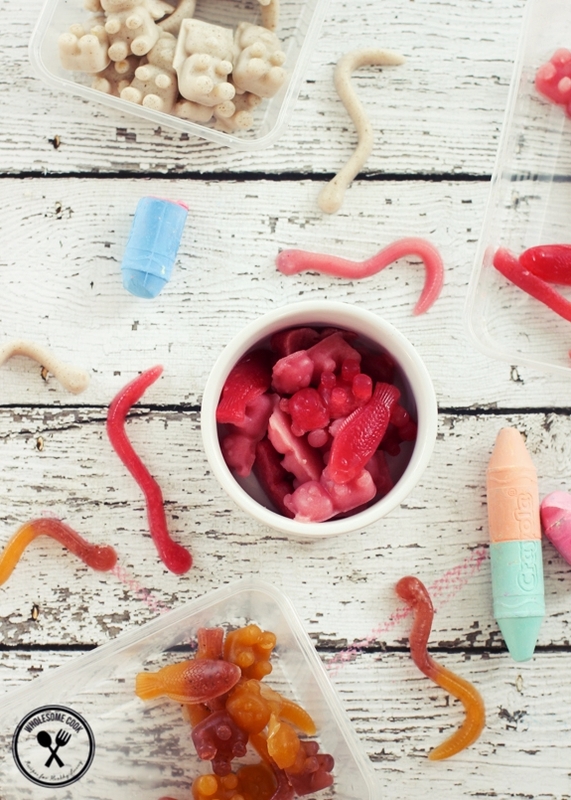 We used this Homemade Gummy kit which comes with four moulds: two gummy bear, one gummy snake and one gummy fish. They are fantastic! So easy to peel off and the container they sit in holds ice for faster cooling and setting. Found on Amazon with Aussie shipping – you will need to get a converter though, it comes with a US plug. You can also just buy the moulds: gummy bear moulds, snakes / worms moulds and lego moulds. 7. To shorten the setting time, place silicone moulds in the fridge over a tray filled with ice. 8. Add Natvia for sweetness. About 1 tablespoon per cup should be fine, but bare in mind that some of the sweetness does disappear once the jellies are set. 9. Vanilla bean powder (I used Honest to Goodness brand) is great for flavouring strawberry or milk jellies. It may seem expensive but the powder is very flavourful so only a little, around 1/4 teaspoon, is needed to add the luxurious vanilla aroma to 1 cupof jelly mix. Not to mention the signature black specs. 10. Milky layers or whole gummy shapes can be achieved using any type of milk really. My personal preference is for organic cow’s or homemade almond milk (Aussie brand Pure Harvest make a great organic almond milk that contains nothing but filtered water, organic almonds and organic rice syrup), they also have oat and rice milk which are great for this too). Agar agar powder is the most common substitute for gelatin in vegetarian and vegan jelly-making. To make Vegan Gummy Bears, add 1 1/2 teaspoons agar agar powder to 1 cup liquid. Unlike gelatin, agar mixture should be brought to a boil to set, so if you are working with heat-sensitive ingredients like probiotics or vitamins, perhaps only boil half the liquid. One of the advantages of agar, apart from being plant-based, is the fact that it does not melt when stored out of the fridge which might make for better lunchbox treats. 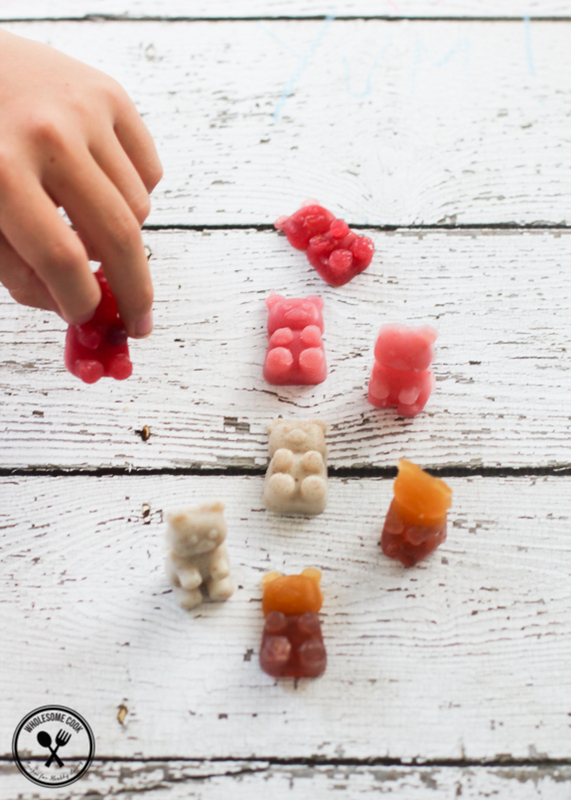 Homemade Gummy Bears are a quick to make and a healthy substitute for store-bought lollies. They don’t have the same stretch which comes from the sugar in regular jellies, but are fun to make and squishy enough for everyone to enjoy them. The fruity gummy shapes were deemed the best by the kids. Liana’s favourite was the strawberry mango duo, while I preferred the slightly more sour raspberry. My all time favourite though was the airy vanilla almond milk jelly with the added benefit of dairy-free probiotics. Creamy, dreamy and delectable. Fruit: berries of all sorts and mangoes provide the best results when making puree gummy bears at home. If using frozen fruit, ensure the puree is close to room temperature before mixing with warm gelatin. You can strain the puree to get rid of the seeds or leave them in, we quite like the texture. Liquid: you can use filtered water, coconut water or milk of your choice for the remaining liquid. For Milky version, use cow's milk or any other milk you like - we used Pure Harvest Organic Almond Milk - it really is like homemade. For a vegan version: use 3 tablespoons agar agar powder instead (available from most Asian supermarkets). Things you can add: probiotic powders, protein powders, green powders, maca, etc. Always add to the cool liquid to preserve nutritional value. Moulds: if you don't have fancy-shaped moulds, pour the liquid into a baking tin lined with baking paper. Allow to set then cut into squares with a knife. Place pureed fruit into a beaker for easy pouring into the moulds. In a small saucepan whisk liquid with gelatin over low heat, until dissolved. It is not recommended for the mixture to boil. Pour the gelatin liquid into the pureed fruit and whisk to prevent the gelatin from setting in clumps. Add anything else you might like and whisk to incorporate. Pour the mixture into moulds and place in the fridge for 15 or so minutes to set (if you place the moulds on top of an ice-filled tray, jellies will set quicker). Remove from moulds and store in the fridge in an air-tight container for 1-2 weeks. Heat 1/2 cup milk and gelatin in a small saucepan over low heat, whisking until the gelatin is dissolved. Remove from heat. Whisk in remaining milk, natvia, vanilla powder and probiotic mixture. Pour into moulds and place in the fridge to set for 15 minutes or so. Remove from moulds and store in an air-tight container in the fridge for 1-2 weeks. Wow! Wow! Wow! Amazing! Love the almond milk and probiotic idea. Gorgeous! You are an inspiration to all mums out there who want to genuinely make their kids healthier and happier through real nutritious food! These bears look so cute! I think the vanilla ones will be my favourites too. Seriously??? Are you sure this is not an April Fool’s joke? If it’s not I am very glad! Weekend project here too. Kids will love this and I will be glad for them to have a lolly treat. You are an inspiration. Hi Mum to 4, I can confirm, this is not an April Fool’s joke! We love these jellies and I hope your family will too! Enjoy! Gelatin is becoming more and more popular in the ancestral health circles, but there’s one thing to take into account and that is the origin of the gelatin. I don’t know what kind of animals are used to produce Australian gelatin so I prefer to buy an American brand (Great Lakes), which is made from grass-fed cows. The other thing to note is that agar-agar of course has none of the benefits than animal collagen has. Hey Gaby, thanks for your insightful comment! I recall eating loads of gelatinous food as kid back in Poland. Gosh, fish in stock jelly is still one of my favourite foods (and in the archives somewhere). When I broke my arm Mum fed me a lot of gelatinous meat to promote healing – it was a back to basics, old wives takes approach and it’s great to see it come back to light. I actually have been using the Great Lakes grass-fed gelatin too (I mention it in the post). There are a couple of other brands around too. I guess for non-meat eaters there’s not really much choice but to go with agar. 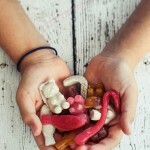 You are having so much fun with the kids and making these lollies for them. Where did you buy your moulds? Great flavor ideas but I guess there are so many options out there but avoid pineapple and kiwi, got it! Fun post and pinning it! Hi BAM, I got my moulds from eBay but they seem more popular on Amazon. I know your kids are a little older, but I still think it’s loads of fun to make these, even with them! this is amazing! im so going to try hunt one of these down locally! What a great idea! I have never thought of making these at home. I don’t have any kids yet to try them out on but luckily my husband loves lollies so I will definitely have to try them out and experiment with a few flavours. Yum! Jellies are great but I had no idea you could make them at home! How great is that! Kids’ll love them, but so will I. These babies are spectacular! What a great healthy treat – you definitely are the queen of healthy treats! Hi My wife and I are writing a FREE ebook on living with G6PDD a Chromosome condition our children have. This condition effects over 20 million people world wide, but there is very little information available to people about this condition, especially parents who have to provide a restricted diet for their children. Our children have to have a diet that has no legumes ie no soy in any form. No food coloring, preservatives, or the many additives in most processed foods, so we make ALL our own foods from scratch. Our ebook is to inform people about the things that people with G6PDD have to avoid as well as the things they can enjoy. We would like your permission to include your recipe for “Gummy Bears” in our book/s. It is so hard to find “treats” for children with G6PDD (and Adults) all commercial confectionery is on the list of foods they Must avoid. Thank you for your note. Of course I would be happy for you to include the recipe (and image) in the eBook as long as you acknowledge the source (wholesome-cook.com). I hope that your book is a success and that it helps families and people with the condition to live happier, healthier lives! Going to make these with the younger siblings! Thanks for the great idea! These look great. Such ingenuity! Love this recipe! How many gummies does this make/how many cups etc? hello. i have made them today, and mine were very soft and had a nasty consistenty. do you know what i did wrong? can it have something to do with that i used gelatine sheets instead of the powder? Please note that agar agar can be a choking hazard for children. Thanks for the tip pat! Having said that the consistency of these gelatine jellies, though softer, could also fall in the same category. Brilliant!! Thank you so much for this recipe. My grass fed gelatin has just arrived and I have just started the SCD diet so am looking forward to some of these to speed up my gut healing! Hi there. Looking forward to making these with my grandson. Does the gelatin taste stay in the lollies? Because sometimes when I have used it in a cheesecake you can taste it and it’s not pleasant. Hi Jo, it shouldn’t – it depends a little on the brand you use as some can have a strong flavour, but the fruit is pretty good at masking it either way. I try to use grass-fed gelatin and find it fantastic for these. What did I do wrong? I used the agar agar flakes. Hi Sofia, sorry to hear that. When using agar agar flakes you have to double the amount used (when a recipe calls for powder). You may also need to bring the agar to a boil – it should set then. Hopefully they’ll work next time. 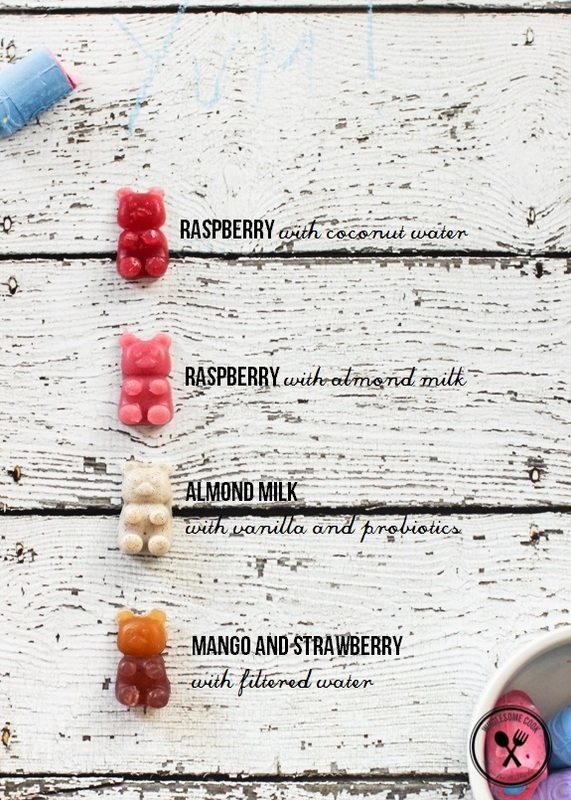 I absolutely love the idea of homemade gummy snacks!! I use to love eating gummy bears until I realized that gelatin was made out of animal products. I just wanted to clarify with you that if I use Agar agar powder, I should add 1 cup of water instead of 1/2 cup like the ingredients list states? Thanks! Kids will love this. Having them take healthy stuff in the form of a pill can be quite challenging. This is quite an amazing idea. I was looking for an alternative to industrial lollies. I tried this a few times and every time it comes out runny. I am using unflavored artificial jel. http://abchealthfoods.com/index.php/unflavored-kosher-jel.html this one. any idea of what to do?? i’ve tried using double the amount of gelatin powder. didnt work. please advise! Thank you for the great post! I didn’t use your gelatin :(, but you gave me the idea to create my own! Yours turned out much better, so I will just have to keep experimenting!! Hi there. I love the idea of these, but when I tried to make them they tasted quite bad. Very little fruit taste, and the agar powder gave a weird chemical after flavour. The consistency was very grainy though I strained the fruit purée to get out all the seeds. I sweetened with 1 tbs xylitol, 1 tbls honey. Hmmm… I’m not sure. It might be the agar powder you used? What brand was it? And some fruit have stronger flvour than others. I am using a fruit pectin, do I also need to add Vitamin C powder or is this over kill? Hi Lucy, you could try to reduce the amount of water used or invest in a dehydrator. Alternatively, you could try dehydrating the gummies in a low (30-50C) oven. As soon as I added gelatine to coconut water it started to thicken up straight away and didn’t even get warm. I was a bit concerned as your directions were to add liquid to the moulds and mine was solidifying rapidly. I used raspberries and Great Lakes. They pretty much disintergrated once put in the mouth. Not gummy at all. Any idea why? I didn’t use gelatin. I used agar powder which is a lot stronger than gelatin. And you have to use a lot less then when using gelatin. Which I found out the hard way. If you use the same measurements as you would with gelatin of the product will be rock hard. i was wondering what molds you use and how you get stuff in an out of it w/o it ripping? Our mango jellies turned out perfectly, but all three kids turned their noses up, even my middle child who LOVES mangoes. (Insert frustrated sigh!) I used a tablespoon of honey but suspect I will need to make them a bit sweeter if my lot are going to eat them. Any suggestions on what would be the best option for sweetening them differently?? Would rapadura work perhaps? Hi Roanna, oh! You could make them using a rapadura syrup (rapadura dissolved in a little water). Otherwise we’ve found that the strawberry ones taste sweeter. Hope that helps. A few stevia drops might also make it a touch sweeter. I am such a big fan of healthy treats, and ones that are stable enough for lunchboxes!. I am being very unsuccessful though…2 batches of gummies using Agar Agar powder and both very stiff and horrible tasting….to be honest I had 1/2 cup of water in my pot and only sprinkled in the first Tablespoon of Agar to dissolve and it got all like wallpaper paste from just that small amount!!. Can someone help me with the correct ratio of liquid to Agar?. 3 TBL per 1 cup is too much I have found. Really want these to work! We just tried your recipe out but with agar agar and the results whilst delish are more typical jelly like than gummy bear. Do you use the same amounts of agar agar as gelatine? Hello!! I love your ideas but is there any way of doing this without refrigerating them? I like to keep sweet treats in my bag for when we’re all hungry for a sweet snack! thank you so much! I’m a kid, but I do all my cooking on my own. I’m also vegetarian, so thank for giving out the agar version. I haven’t tried these yet, but I’m sure they’re delish. I really want to try these but in your write up it states 1 1/2 tsp Agar Agar to 1 cup liquid. Yet in the recipe you state 3 tlbspn Agar Agar to the liquid. I tried some but they end up like ice cubes not gummy. Any ideas why? I used agar powder (3 tablespoons), raspberry and water. (I’m sure it’s me by the way – not the recipe!). I used agar powder (3 tablespoons), raspberry puree and water. (I’m sure it’s me by the way – not the recipe!). If you want to use Kiwi fruit then you must boil them first. A tip I learnt from anime. Thank you for posting the VEGAN version of this recipe!!! I don’t think many people realize the cruelty that comes to animals to obtain gelatin and while agar may not have health benefits, most of the things vegans eat do! There are so many options to add in vegan vitamins and probiotics as well! Cows milk has been proven in recent years to cause more health issues than we realize (and none of the benefits the industry claims). MUCH research has been done on this topic! All the health benefits mentioned above can be found in vegan foods, fortunately with none of the negative effects on humans or the animals they are derived from. Thanks again so much for posting this and I look forward to trying the recipe! These look so delicious and there are so many good things that you can add into them. However, I just wanted to let you know that adding the probiotic capsules is a bit pointless as probiotics are live bacteria and are activated by both heat and moisture so by adding them into this recipe the live bacteria would have died off by the time you eat them and therefore not do anything to help. This is only the case with live bacteria, so there are many other things you could put in there such as vitamins and minerals that would be very beneficial. Looks like a great recipe that I’ll have to try with my nephew though.